XCMG’s Great Proficiency Manifested in Wind Turbine Hoisting_Company News_News_JINNING UNITED CONSTRUCTION MACHINERY CO.,LTD. An XGC16000 crawler crane successfully installed a 6MW wind turbine at a major port in Jiangsu on 26 January. This 6MW wind turbine, one of a few prototypes with 77.7m long blades, is currently the largest in China. According to the hoisting requirements, XCMG XGC16000 crawler crane, with a boom of 72m and a tower jib of 60m, hoisted 190t blades and hubs into place successfully. 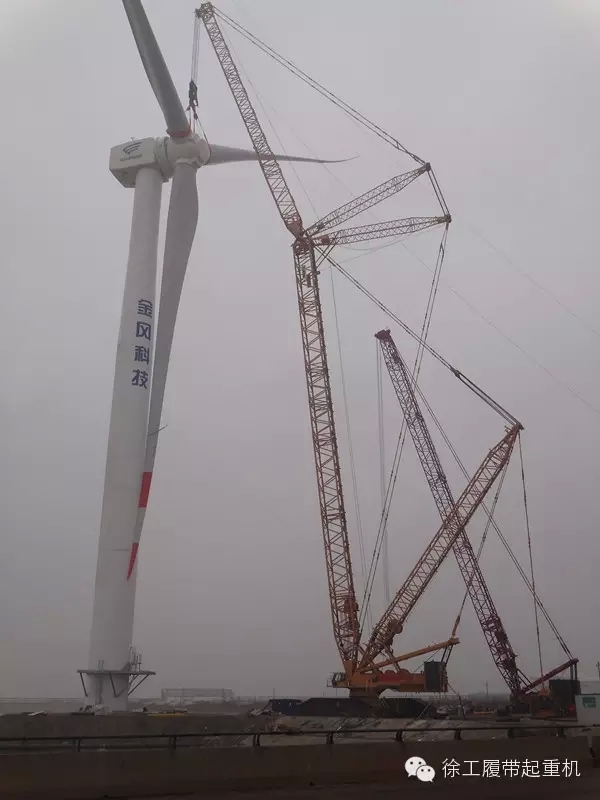 This is a solid step for XCMG XGC16000 crawler crane after it entered large wind power fields last year. XCMG has XGC260, XGC300, XGC400, XGC500, XGC650, XGC800, XGC15000, XGC1600, XGC28000 and other mature series crawler crane products. These products meet hoisting of 1.5MW, 2.0MW, 3.0MW, 5.0MW, 6.0MW and above wind turbines at home and aboard, and they are featured by high lifting performance, lifting height, disassembly and assembly efficiency, etc.